Ce document au format PDF 1.4 a été généré par Arbortext Advanced Print Publisher 9.0.223/W / Acrobat Distiller 5.0.5 (Windows), et a été envoyé sur fichier-pdf.fr le 30/03/2012 à 01:34, depuis l'adresse IP 109.12.x.x. La présente page de téléchargement du fichier a été vue 1689 fois. 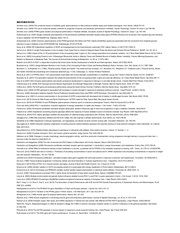 Taille du document: 125 Ko (11 pages). sessions occurred pre, mid, and post a 20-week training period. Address correspondence to Dr. Sophia Nimphius, s.nimphius@ecu.edu.au. these variables changes over the course of a season. athletes were assessed on multiple criterion measures. preseason and in-season training period lasting 20 weeks. pool where players are selected for the national softball team. each participant before commencement of testing. percentages of approximately 30, 50, and 90% of their estimated 3RM, based on previous testing and training records. Subjects then attempted a weight at their estimated 3RM. cord at a height that equated to a horizontal thigh position. was calculated as estimated 1RM divided by BW. correlation coefficient (ICC) $ 0.96 and CV , 3% (18). using previously described methods (10). dominant; 1B = first base; and 2B = second base. †Correlation is significant (p , 0.01) (2-tailed). ‡Correlation is significant (p , 0.05) (2-tailed). †Correlation is significant (p , 0.05) (2-tailed). *ND = nondominant; D = dominant; 1B = first base; and 2B = second base. ‡Correlation is significant (p , 0.01) (2-tailed). normally bat from the left side of the box. right-foot dominant and left foot batters left-foot dominant. speed, and change of direction measures (r = 0.70–0.93). measure of performance at any time point. measures of speed (r = 0.81–0.94). significantly with all speed measures (r = 20.71 to 20.94). posttesting (r = 20.46 to 20.90). performance (r = 20.57 to 20.79). differ from previously reported relationships in male athletes. This study provides evidence that cross-sectional relationships between variables should be evaluated cautiously. a different rate, therefore, affecting the strength of correlation. limited research in the literature. 20.32 to 20.57) at pre, mid, and posttesting (Table 1). times at pre, mid, and posttesting (r = 0.70–0.93) (Table 1). strength. However, this should not be interpreted as smallersized athletes will perform better in the sport of softball. performance is measured without the use of an arm action. varying degrees of correlation between VJ and sprint speed. not show correlations near this strength (r = 20.21 to 20.58). 10-m performance (r = 20.39) (2). beyond 30 m are more a measure of maximal velocity (2,30). mid (20.84; p = 0.004), and post (20.80; p = 0.03) testing. 0.01), and post (20.83; p = 0.02) measures. strength and 40-m sprint performance (r = 20.66; p , 0.05). 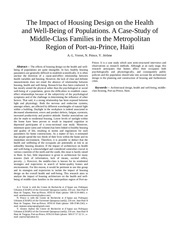 Meckel et al. (r = 20.88) (19). a stronger indicator of change of direction performance. complex and longer than a 505 change of direction test (9). between dominant and ND legs should be investigated. measures of speed at pre, mid, and post–time points (Table 4). time indicates another factor may influence this relationship. which is the ND foot for most athletes in this sport. variables seem to have an inconsistent relationship. relative strength and relative PP at JS40 and 2B sprint). optimal in both their conditioning status and skill ability. correlate to performance measures through the season. female athletes than the correlation found in male athletes (4). change of direction performance longitudinally. interest for any of the authors of the present study. measures of strength and power in professional rugby league players. 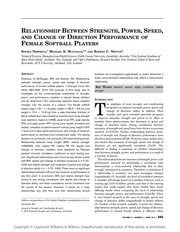 J Strength Cond Res 13: 230–235, 1999.
female volleyball athletes. 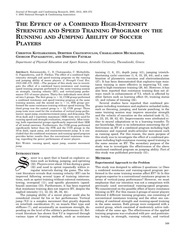 J Strength Cond Res 21: 1192–1196, 2007.
speed. J Strength Cond Res 19: 349–357, 2005. Cond J 29: 86–95, 2007.
horizontal plane. Aust J Sci Med Sport 17: 15–18, 1985. 7. Dugan, EL, Doyle, TL, Humphries, B, Hasson, CJ, and Newton, RU. and calculations. J Strength Cond Res 18: 668–674, 2004. 9. Hoffman, JR, Ratamess, NA, Klatt, M, Faigenbaum, AD, and Kang, J.
patterns? Res Sports Med 15: 125–132, 2007. 2002. Accessed January 26, 2006.
performance. J Sport Rehabil 10: 196–204, 2001.
sprinters. J Sports Sci Med 5: 359–366, 2006. 16. McBride, JM, Triplett-McBride, T, Davie, A, and Newton, RU. Cond Res 12: 216–221, 1998.
sport and phase of training. J Strength Cond Res 20: 992–995, 2006. 19. Meckel, Y, Atterbom, H, Grodjinovsky, A, Ben-Sira, D, and Rotstein, A.
and closed chain lower extremity strength and functional performance. J Sport Rehabil 9: 46–61, 2000.
the lower extremities. J Strength Cond Res 20: 971–977, 2006. 22. Pauole, K, Madole, K, Garhammer, J, Lacourse, M, and Rozenek, R.
collegiate athletes. J Strength Cond Res 20: 867–873, 2006.
training and testing. J Sport Sci 24: 919–932, 2006.
baseball players. J Strength Cond Res 20: e25, 2006. 27. Thomas, JR and Nelson, JK. 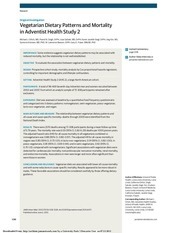 Research Methods in Physical Activity. Champaign, IL: Human Kinetics, 2001. Ce fichier a été mis en ligne par un utilisateur du site. Identifiant unique du document: 00103731.